Home / All Posts / WriteShop Primary / Timed-release curriculum? You’ve heard of timed-release cold capsules, motion-sickness patches, and fertilizers. But timed-release curriculum? In a sense, that’s what these past couple of months have been about—a slow-release introduction to our up-and-coming WriteShop Primary series for grades K-3. Today, let’s “release” just a bit more about this exciting new program! 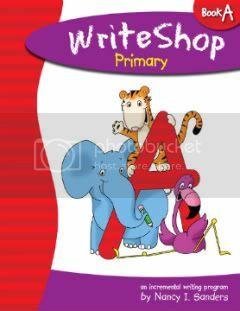 WriteShop Primary is a parent-guided program. You won’t find a student book filled with pages of busywork. Instead, you’ll get a manual filled with daily, easy-to-implement activities to share with your young learner. You’ll love how WriteShop Primary accommodates pre-writers as well as beginning and developing writers. The program teaches the skills of the writing process at the very simplest level through engaging activities, crafts, and picture books. It creates an environment that promotes a joy of learning in your youngest students. And extra challenges appear throughout each lesson to keep the interest of a more advanced child. “Each lesson is designed to be like a friendly chat between parent and child. Since early lessons have the option to be entirely oral on the part of the child, there is no pressure, only the opportunity to talk about things that are familiar to him as he watches Mom write down his words. What Does “Book A” Teach? Book A teaches writing at the kindergarten/first-grade level. Reluctant second graders will enjoy it as well. Book A contains the following ten chapters, or lessons. You can spend one to three weeks on each lesson. For example, you would want to move slowly with a kindergartener and more quickly with a second grader. Generate ideas for a story. Experience planning a story before writing it. Gather simple information about a topic. Use a story web to organize information. Identify beginning, middle, and end. Think of simple ways to improve a story. Publish a story through a project or craft. Reading and writing color words. Reading and writing common sight words. Identifying and using punctuation marks at the end of a sentence. Beginning a sentence with a capital letter. For more details on WriteShop Primary, visit our website. Books B and C continue to reinforce these concepts. Meanwhile, your students will further develop their budding writing skills through more advanced yet age-appropriate writing activities. What could be more fun? In the next few weeks, we’ll begin to share more about Books B and C. Meanwhile, to be notified about WriteShop Primary’s release dates, please email us at preorders@writeshop.com.